So I'm up bright and early, and before I hit the highway i thought I would post a little bit more. 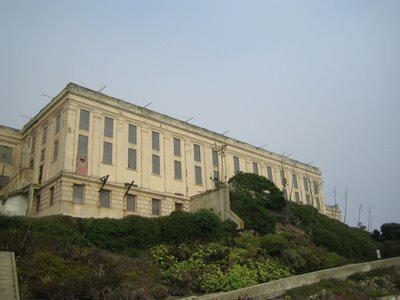 So when you arrive on Alcatraz you have to climb roughly 13 stories, fortunately there is a long winding ramp, but there was a tour about escapes that was led by a guide starting in 7 minutes, so I tried to hustle. Now I don't want to sound cruel or rude, but the tour guide emotionless, and lacked any dramatic flare. So she was trying to "make you think" about the meaning of escape, and if those who died in the attempts, or who took their own lives "escaped." I appreciate the sentiment, but her delivery could use work. Of all the escapes the funniest was probably the one that took the most work to implement. 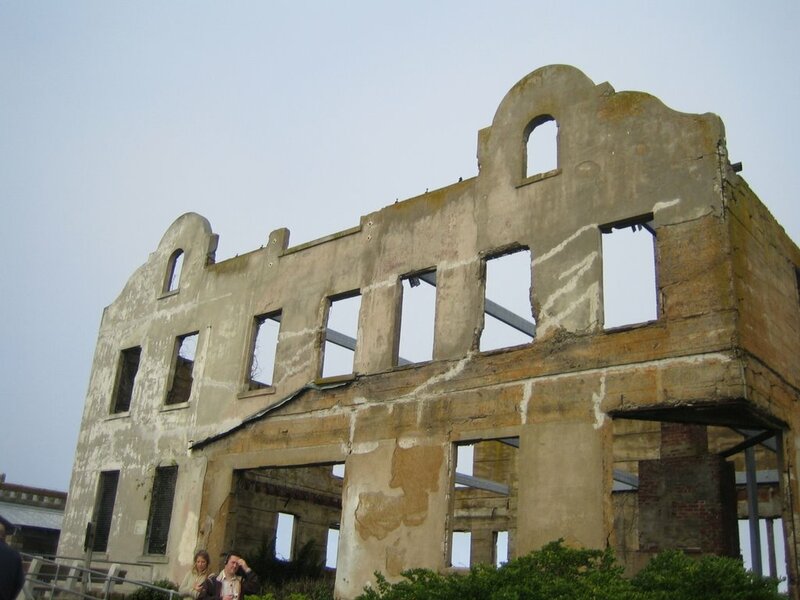 At the time Alcatraz used to do the laundry for the Presidio and Angel Island (both are military facilities.) So over the course of 10 years, this one inmate who handled the laundry at the dock picked pieces of laundry out one at a time until he had a complete sergeants uniform, and hid it under the dock. Then after all these years of preparation, he saw his chance. A group of military engineers were on the island doing repairs, so he suited up under his prison issue jump suit, and waited. When the engineers left at the end of the day, he just stripped off the coveralls and slid in with them. Unfortunately for him, someone noticed the extra passenger, and they had the captain contact Alcatraz. Before their boat landed the associate warden had hopped in the prison boat and sailed to meet them. As he stepped off the boat the warden was waiting to greet him. He had about 15 minutes of freedom. As a final kick in the teeth, the group of engineers were stationed at Angel Island, making his escape essentially futile. So after the person tour, I took the audio tour, it was about 45 minutes, and it was fantastic. 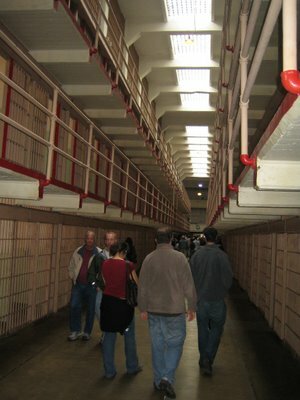 It was narrated by ex-prisoners and guards. 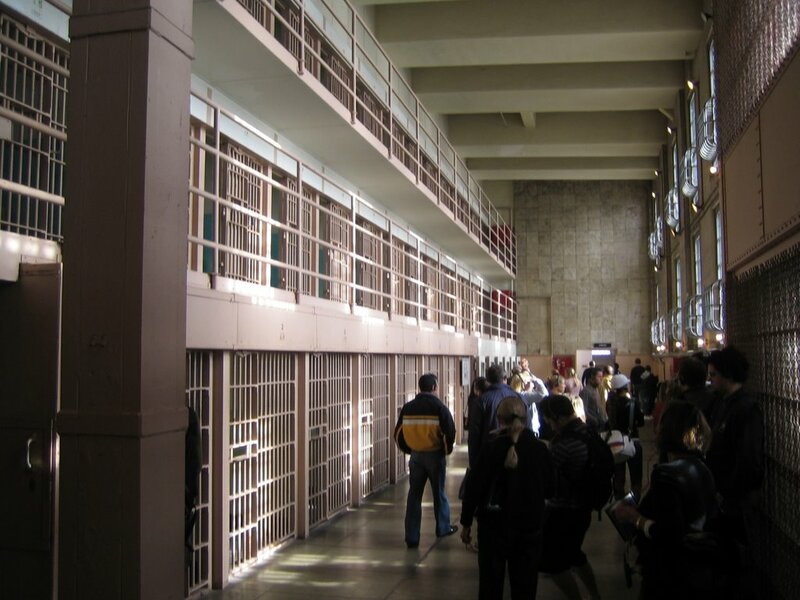 It wound is way through the cell block and administration facilities, and was spliced with sounds of the prison that we so well timed, and balanced that I could swear cells were being opened and shut beside me. 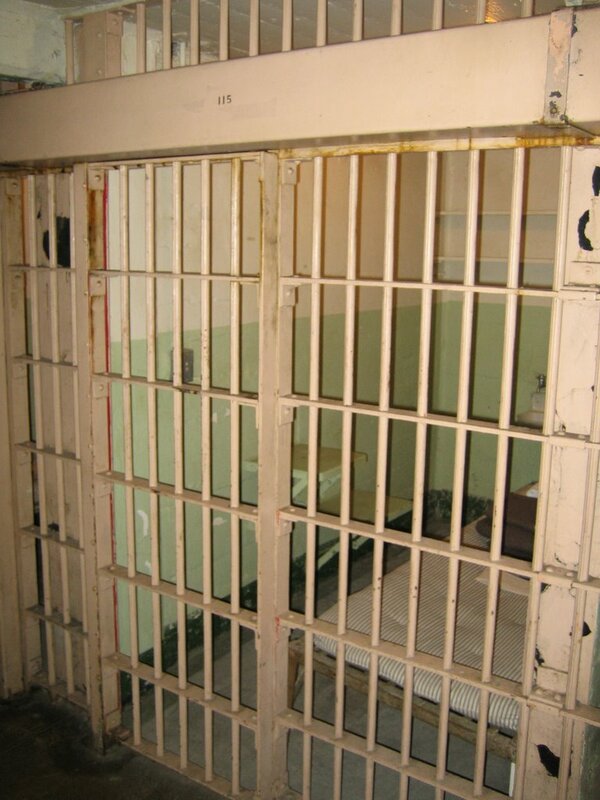 So here is a cozy standard issue cell, I think they are 5'x7'x9'. I think the master bathroom in our house is bigger. 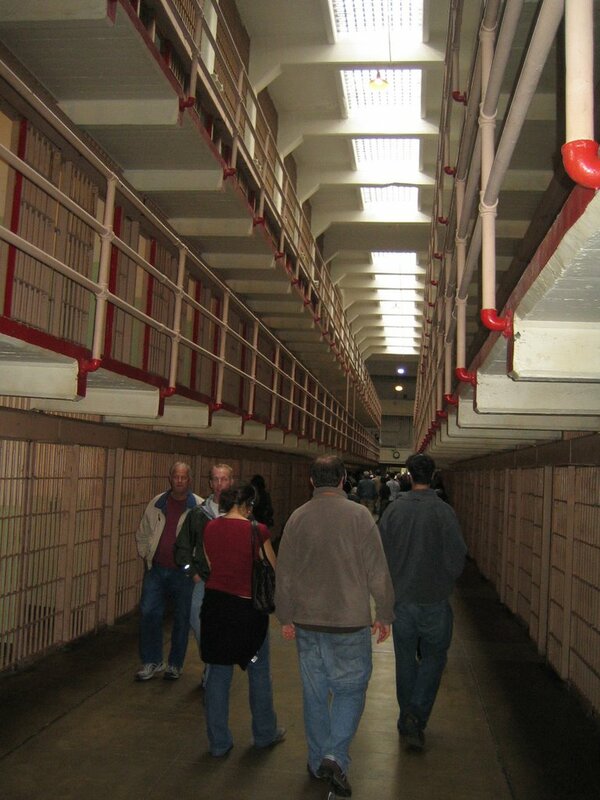 Here is one of the main cell blocks, there are three in total. 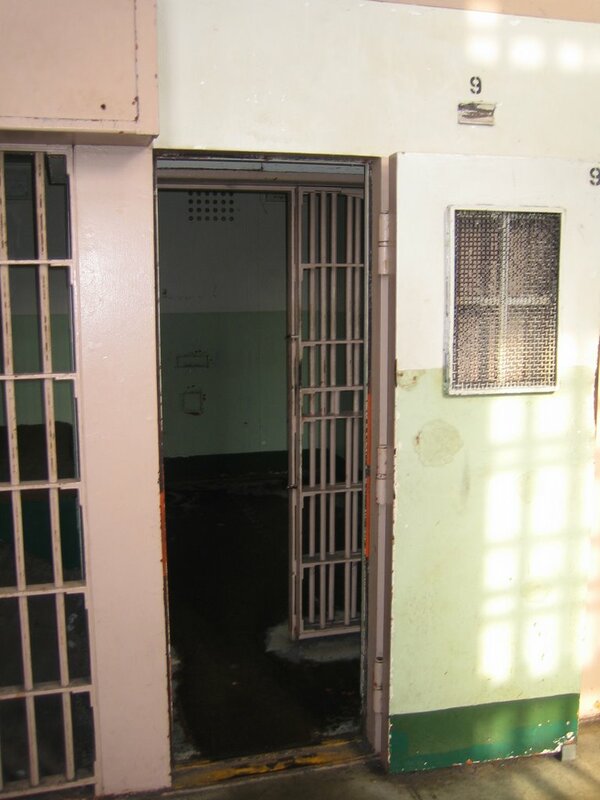 This is D block, these are the isolation cells, if you are in here your in here for good. 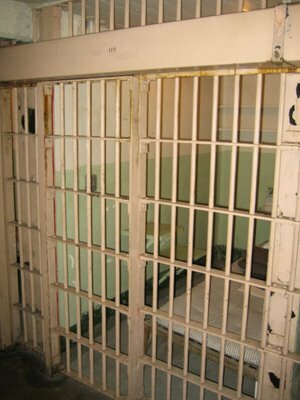 24 hours a day 7 days a week you are in these cells, except for one brief exercise break/shower per week. Also in D block where these solitary confinement cells. When the outer door shuts, they go pitch black, and fell very very claustrophobic. 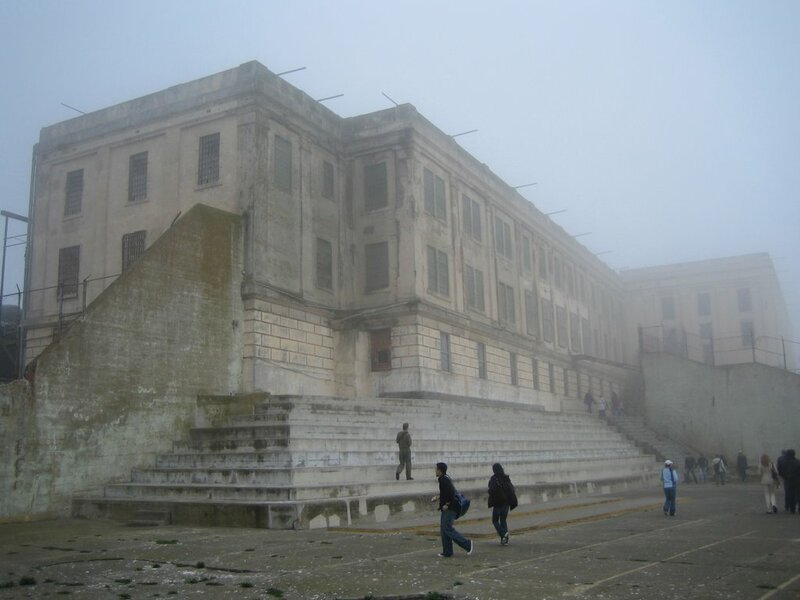 Here is the exercise yard, its kind of run down, but I don't think it was ever "cozy." 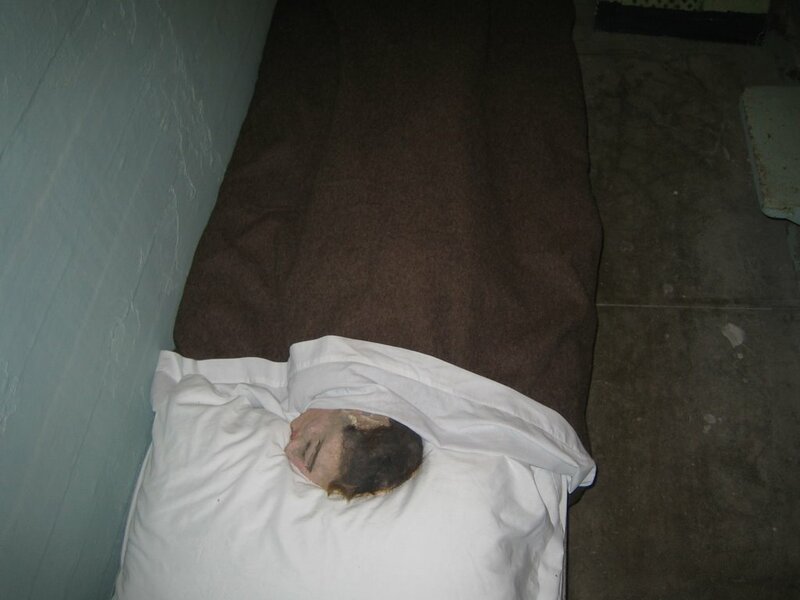 Here is one of the famed fake heads used to trick the guards during one of the more successful escapes. Their bodies were never found, but some debris was found on the mainland that lends credence to their escape. I would hope that after their escape they might have left it in there will or something so the world would know. 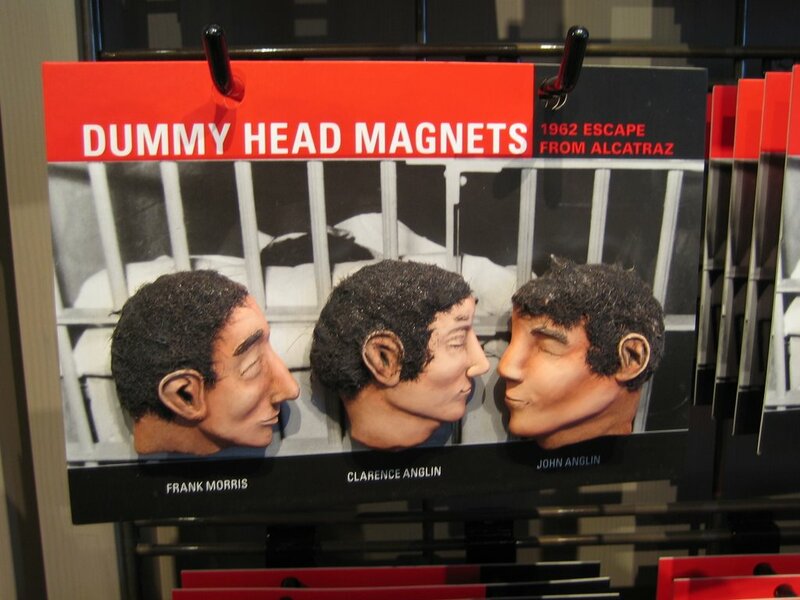 I considered picking up these tacky kitsch magnets, but I figured a picture would do, they are replica fridge magnets of all three men who escaped that night. There escape took years of preparation as the tunneled through the back of their cells into a utility corridor, and then up on to the roof. To his chagrin they made there escape while the warden was on vacation, and the associate warden was on duty. This is a city side view of the cell block. This is the lighthouse, it is actually the second light house built, as the first became ineffective when the cell block was built. 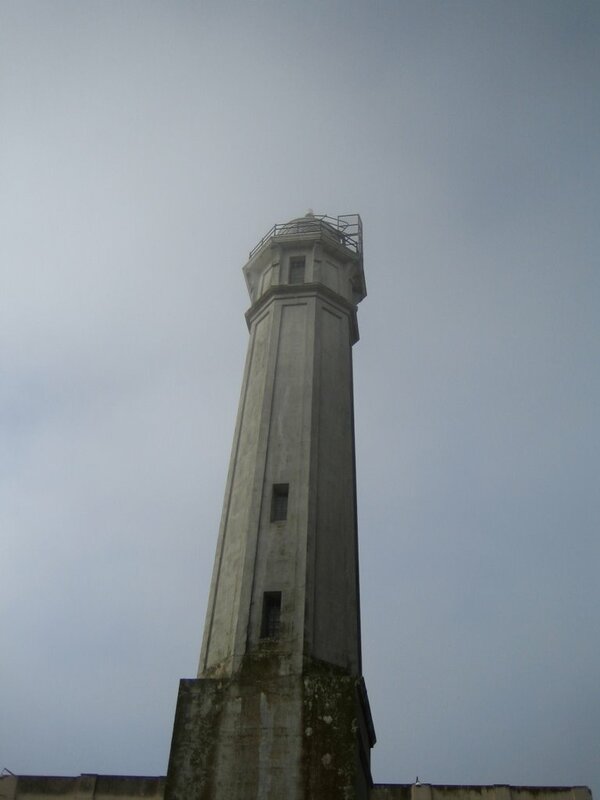 The lighthouse is actually still operational. The first light house also has the distinction of being the first light house built on the West coast of North America. The old warden's house. It has seen better days, actually much of the island is falling into a ruinous state as the salt in the air accelerates deterioration. Well thats all for now, I have some more shots looking back on the Bay bridge and the city, as well as some of the island ecology, but my car is ready, so I'm off.